Check out this article to see information, stats, and recaps from the league’s action this week. After last week’s 1 win effort, it looks like TEABAGGERS were able to regroup. They weren’t messing around when it came to wins this week, winning 6 games. No other team notched more wins. As a result, TEABAGGERS moved up from 10th to 4th in the wins standings. 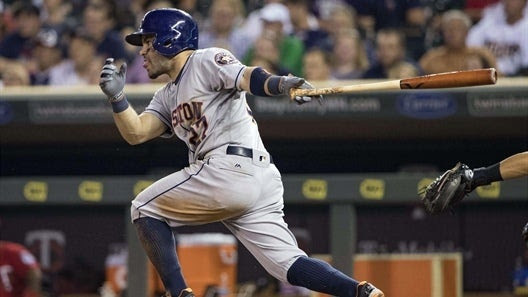 DEADWOODS got the league’s top batting average performance this week from Jose Altuve. Altuve hit .529 while leading DEADWOODS to a .306 BA overall. After his performance this week, he is looking like a darn good waiver wire pickup. His performance pushed DEADWOODS from 9th to 2nd in the batting average standings. SALUKIS might want to schedule some time in the weight room after they managed only 2 home runs this week. No other team hit fewer home runs. SALUKIS had a league low two players who contributed anything in that category. Tyler Naquin was one of the twelve no shows. That caused SALUKIS to fall from 5th to 10th in the HRs standings. Things weren’t better in other categories, as they fell off a cliff in the overall standings, going from 6th to 10th. Colt 45s made a move in the only category that really counts this week, going from 9th to 7th in the overall standings. They rose up due to good performances in three categories, including a two spot jump in RBIs. Coach Kelly’s squad was led by the tag team of Aaron Hicks and Trey Mancini, who together tallied 16 RBIs. It was not all sunshine and unicorns however, as Colt 45s dropped in three stat categories, including moving down two places in saves. SCHNOOKERS and SALUKIS weren’t remotely close in the RBIs standings last week (12th and 7th respectively). After this week’s action however, they’re neck and neck (9th and 10th respectively). SCHNOOKERS accomplished this feat by totaling 36 RBIs. Coach Schneller’s squad got a nice group performance in that category, as seven players beat the league average. Jonathan Schoop was the first among equals, posting 6 RBIs. Meanwhile, ARMCHAIR SLUGGERS produced only 28 RBIs due to poor performances from Kyle Higashioka, JaCoby Jones, and Jarrod Saltalamacchia, who each failed to drive anybody in.